You’ve heard Him described as “the reason for the season.” For Christians, He is actually the reason for our lives, our walks, our growth, our faith. Who is He? He is Jesus. 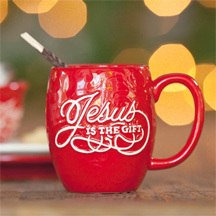 And in honor of Jesus, DaySpring has create yet another beautiful collection of products to help remind us of Jesus and the gift that He gave us. The gift of a chance for a better life and the opportunity to grow and learn to be more Godly, more faithful, and more humble people. Jesus gave us a gift and He is the gift. Jesus is the Gift is a movement that focuses on and honors Jesus as the ultimate gift. We encourage Christians to celebrate Him by tying a ribbon around a cross as a visual reminder of His sacrifice. We also challenge believers to engage in gift giving as a loving act of ministry and reflection of Jesus rather than a chore or obligation. Our goal is not to discourage the many wonderful aspects of the Christmas season but to redeem giving, decorating, and celebrating in a way that brings “Glory to God in the highest, and on earth peace, good will toward men” (Luke 2:14 KJV). If you couldn’t tell by my new wall decorations and my previous post about the DaySpring Ever Grateful Memo Board – I LOVE DaySpring products. They are all beautifully made, are durable, and have great style. The new Jesus is the Gift Collection has all of the same characteristics. 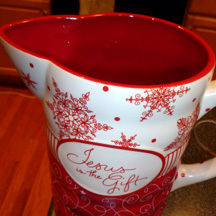 I was able to try out their Jesus is the Gift Snowflake Collection Pitcher and loved it. Why? Well first, there is the very holiday decoration – the white and red, plus the ornate snowflakes are festive but aren’t TOO much. Next, it’s gotta be the verse that is written on both the side and the bottom of the pitcher. 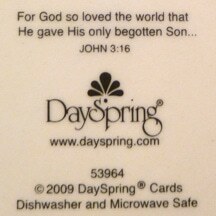 It says “For God so loved the world that He gave His only begotten Son… John 3:16” That quote right there is effectively blessing every drink that gets poured from the pitcher. Finally, it’s dishwasher and microwave safe, which means you can heat up your hot drinks in it and serve straight from the pitcher. 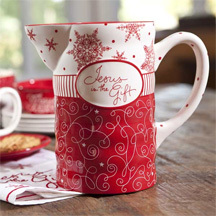 I really think that the Jesus is the Gift Snowflake Collection Pitcher brings a touch of homey elegance that a plastic blue pitcher just cannot do. You can see from the picture above that the interior of the pitcher is a solid red color – an attention to detail that I don’t think everyone considers. The pitcher holds about 10 cups of liquid, which fills it to the very brim. More comfortably it would be around 8 cups. And if you’ll be going shopping at DaySpring, don’t forget to use one of these discounts to save! Visit www.dayspring.com and leave a comment with the Jesus is the Gift product you like the best. For ONE bonus entry, follow DaySpring on Twitter and leave a comment with your Twitter handle or “Like” DaySpring on Facebook and leave a comment with your FB name. Feel free to drop a note telling them The WiC Project sent you. Giveaway ends at 11:59 PM EST, December 17, 2010. I like the Jesus Is The Gift Snowflake Apron Item 53923 for $19.99 the best at DaySpring. I now Follow DaySpring on Twitter. I already Like DaySpring on Facebook. I subscribe to The WIC project via email and I already Like The WIC project on Facebook. I like the Jesus is the Gift = Sterling Silver Necklace. I like the Jesus is the Gift serving platter. I followed DaySpringCards as wiscmom24 on Twitter. I like the Plant Pick in the collection! I love the metal yard sign! I like the peace on earth advent calender! I like the Jesus is the Gift Snowflake Apron! Thanks for entering me into this giveaway. I like the Christmas Cookies – Set of 4 Inspirational Christmas Ornaments. They are beautiful. 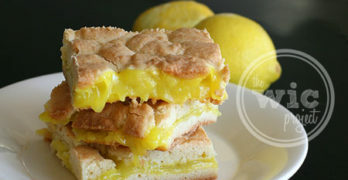 I like DaySpring on FB – Rebekah F.
I follow DaySpring on twitter as @hrbeck. I subscribe by email and like you on FB as well. Their Jesus Is the Gift Snowflake – Half Apron caught my eye at DaySpring! Subscribed to the WiC Project blog RSS google feed. 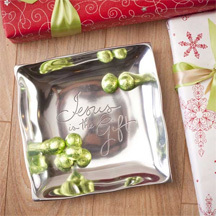 I like the Jesus is the Gift serving platter, thanks! I love the plant pick! I love Dayspring! It would be awesome to win this. My favorite item is… (it’s so hard to choose)… the Snowflake Collection – Star Trivet. I like Dayspring on FB. Also subscribing to your RSS feed.